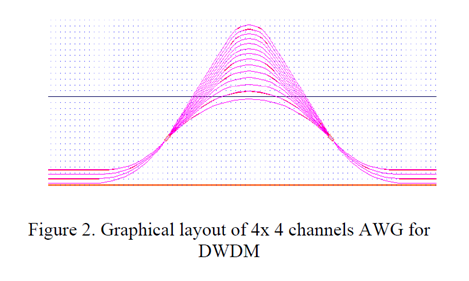 The schematic layout of the 4×4 channel AWG for DWDM with central wavelength of 1.55 μm is shown in Figure 2. The position of input port and output port is symmetrically formed, which are identical. 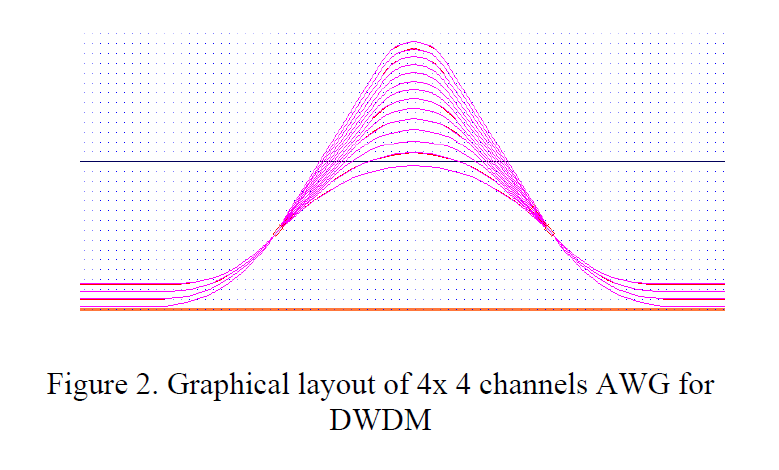 WDM_PHASAR design tool from Optiwave®, has been used to design two types of 4 channels AWG operating at central wavelength of 1.55 μm, with channel spacing of 0.8 nm and 9.6 nm, for DWDM and CWDM applications, respectively. The refractive index of BCB polymer core at 1.55 μm is 1.5556.The cladding is ORMOCER which is having a refractive index of 1.537, while the substrate is silicon which has been widely used in microelectronic and integrated circuit. ORMOCER (ORganically MOdified CERramics) is photopatternable inorganicorganic copolymers with negative resist behaviour. 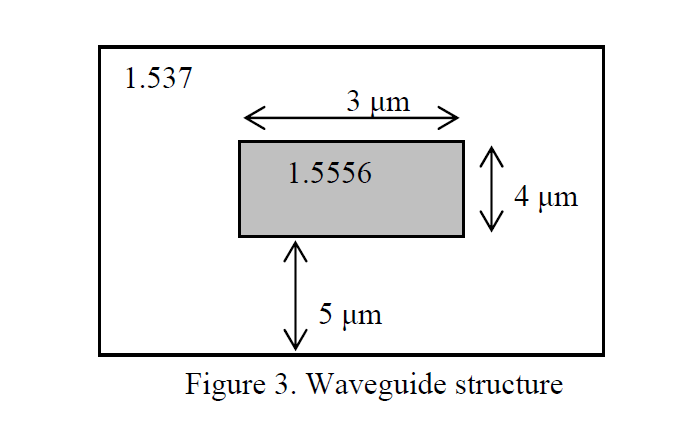 The core size is 3 μm x 4 μm with buried type waveguide, as depicted in Figure 3. The port separation of input/output is designed to be 250 μm with 100 μm connection offset for pigtailing to fiber ribbon. 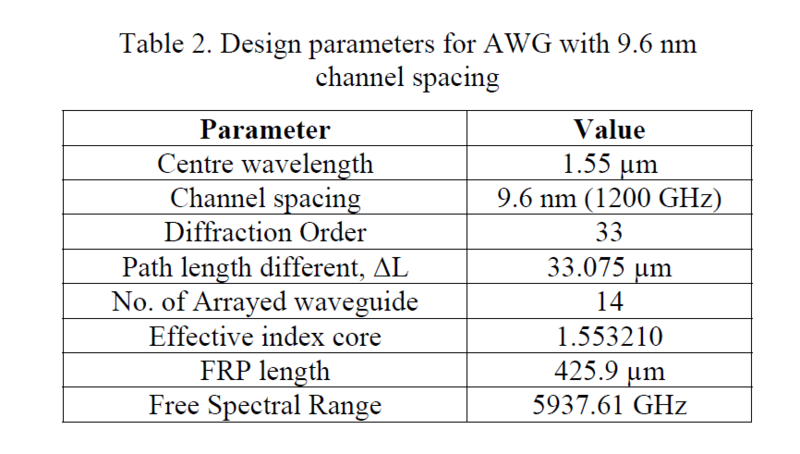 All design parameters are listed in Table 1 and Table 2 for AWG, central wavelength of 1.55 μm with channel spacing of 100 GHz and 1200 GHz, respectively. In the design, the refractive index contrast between core and cladding is quite large (~1.2%), which results in small bending radius and contributes to small chip size. However, the coupling loss between waveguide and fiber that result from mode-field mismatch increases. The total device size for AWG with 100 GHz spacing is 21.5 x 10mm2 and 17.8 x 5 mm2 for AWG with 1200 GHz spacing. This difference is due to path length increment in AWG with 100GHz spacing is greater than AWG with 1200GHz spacing with same orientation angle. 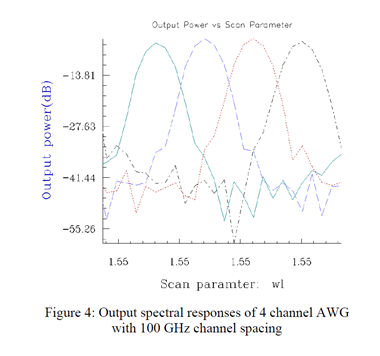 The simulation result of AWG with channel spacing of 0.8 nm is shown in Figure 4. It shows the output distribution of the 4 channel output waveguides. 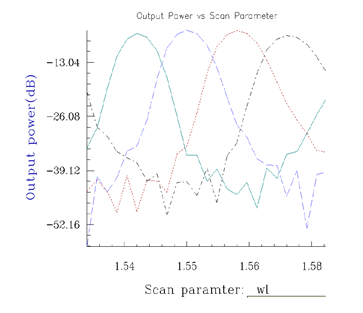 The output channels are at wavelengths 1549.04 nm (λ1), 1549.872 nm (λ2), 1550.704 nm (λ3) and 1551.360 nm (λ4) respectively, which indicate the simulated channel spacing of 0.832 nm. 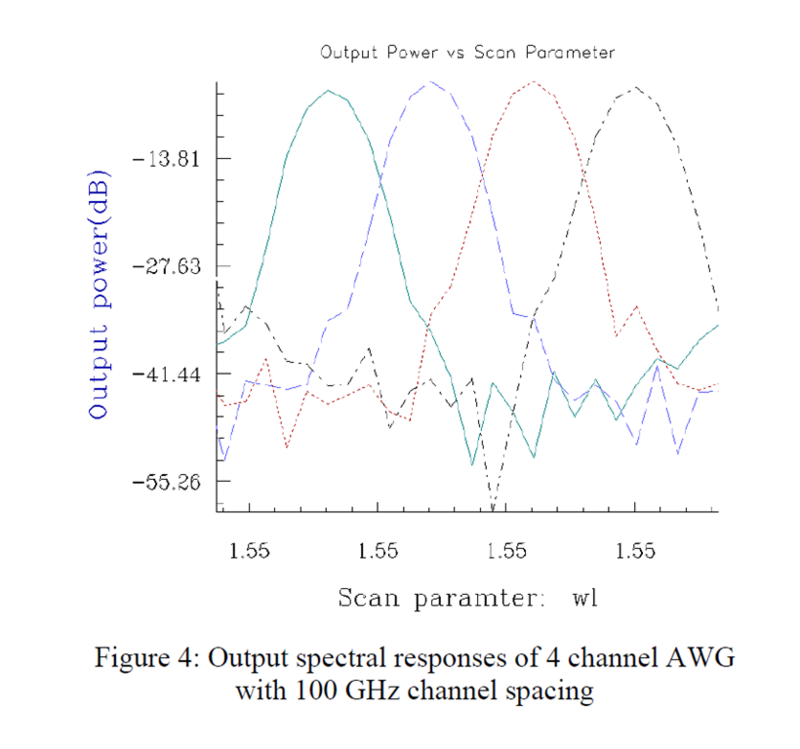 Thus, output wavelength for each channel followed ITU specification, even it is slightly shifted 0.032 nm which is too small and can be neglected. However, the maximum insertion loss of 5.04 dB is at channel 4 and the minimum insertion loss of 3.88 dB is at channel 2. The crosstalk is less than -32.77 dB. 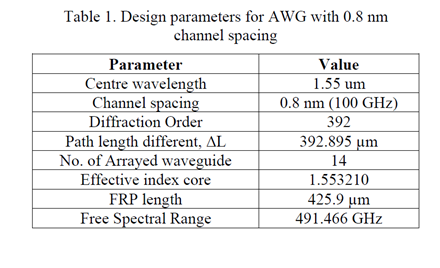 Table 3 shows the computed output parameters of AWG with 0.8 nm channel spacing. 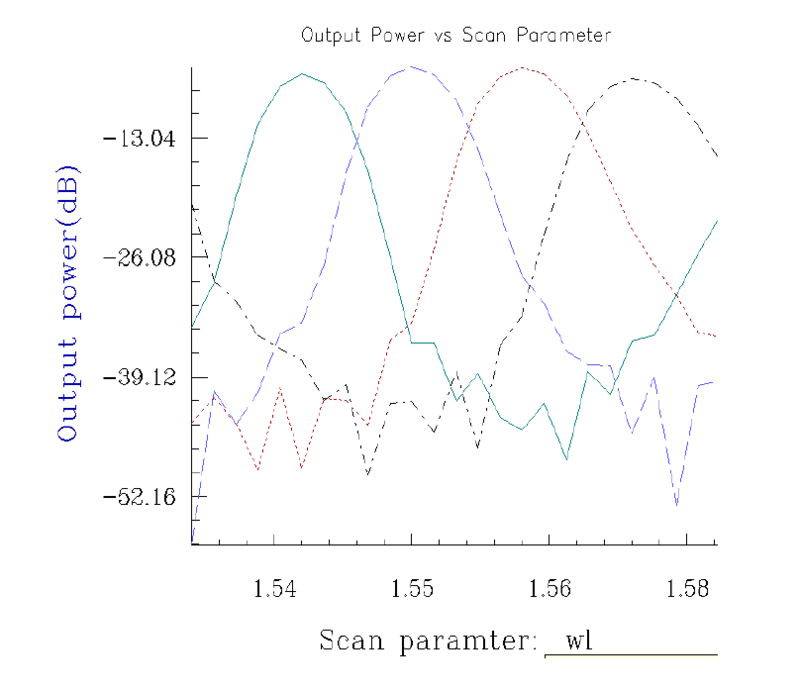 These values have been computed at bandwidth level of -3 dB. The bandwidth level is used as the reference to define the bandwidths. For AWG with channel spacing of 9.6 nm, the simulation result is shown in Figure 5. The four output wavelengths λ1, λ2, λ3 and λ4 are at 1542 nm, 1552 nm, 1562 nm and 1572 nm, respectively. Result for channel spacing is 10 nm which is slightly different from the design input parameter, which is 9.6 nm. Meanwhile, the maximum insertion loss of 6.63 dB is at channel 1 and the minimum insertion loss of 5.30 dB is at channel 3. The crosstalk is less than -23 dB. 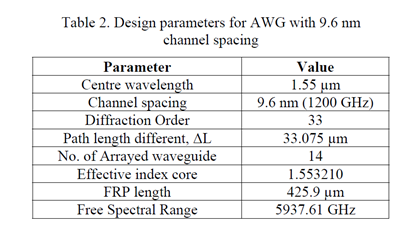 Table 4 shows the computed output parameters of AWG with 9.6 nm channel spacing. These values have been computed at bandwidth level of -3dB. The value for channel spacing obtained is 10 nm which is in the range of CWDM applications..According to the simulation results, we found out that these AWGs can work properly in DWDM and CWDM system. Development of AWG polymer multiplexer has become interest to many researchers. The first polymer AWG demonstrated by Hida et al applying deuterated fluoro-methacrylate (d-PFMA) on silicone substrate. However this AWG only operated at 1300 nm window with some polarization dependence as small as 0.03 nm. Watanabe et al reported 16 channels polymeric AWG operated at 1550 nm was realized using silicone resin waveguide. This AWG multiplexer has an insertion loss in the range of 9 to 13 dB, a crosstalk less than –20 dB and a low polarization dependent wavelength shift. Leo  demonstrated 2 x 8 AWG polymer based on CWDM (20 nm) at center wavelength of 1520 nm with total device size of 23 mm x 2.5 mm. The insertion loss and crosstalk are found to be around 7 dB and -30 dB, respectively. On the other hand, Razali [proposed 4 x4 AWG polymer with 0.8 nm (DWDM) spacing operated at center wavelength of 1570 nm. The device has insertion loss of 3 dB and crosstalk level less than -30 dB.The device size is 31 mm x 9 mm. 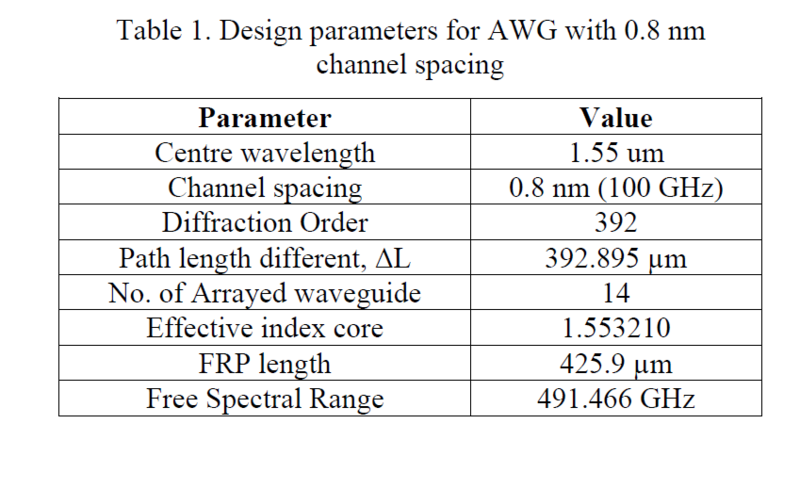 In this paper, the proposed designs are 4 x 4 AWGs polymer operated at central wavelength of 1550 nm with channel spacing of 0.8 nm and 9.6 nm. It is observed that the insertion losses of the corresponding channel spacing are -5 dB and -6 dB, respectively and the crosstalk level are -33 dB and -23 dB, respectively. The total device size is 21.5 mm x 10 mm for 0.8 nm spacing and 17.8 mm x 5 mm for 9.6 nm spacing. Inevitably, this shows that the AWGs for CWDM and DWDM application can be realized by utilizing BCB 4024-40 polymer as the guiding material. AWGs based on BCB polymer for applications in DWDM/CWDM have been presented. Two designs of four channels AWG with crosstalk level below-32 dB and-23 dB have been demonstrated to operate in 1550 nm communication window for DWDM and CWDM application. It can be concluded that the BCB polymer can be considered as a suitable candidate for the development of AWG as it shows good performance for DWDM and CWDM applications.